On October 1st, Kimpton’s Firefly Restaurant will launch “Beat the Clock,” a happy hour with progressively timed and priced food and drink specials available Monday to Friday from 3:00 to 7:00 p.m. Drink specials include house wines, draft beer and rail cocktails only. Chef Danny Bortnick has selected “Seven Salty Snacks” that are available for $5 throughout happy hour. * From 6:00 to 7:00 p.m. drink specials increase to $4 before reverting back to regular pricing after 7:00 p.m.
* On Monday nights, the clock stops at 7:00 p.m. and $4 drink specials will be available until last call at 11:30 p.m.
Firefly has recently become one of a select few restaurants in the D.C. area to serve Batch 19, a special brew made from a pre-prohibition era recipe. The beer will be available on tap in the bar and lounge area, where guests can order 64 oz. growlers of Batch 19 for $15 during happy hour and $20 afterwards. 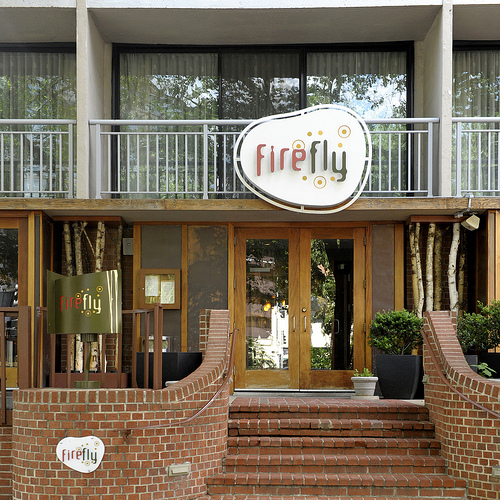 Also, guests can now check-in to Firefly on foursquare, where the restaurant offers a complimentary glass of sparkling wine for first time check-ins. Guests should check-in often as the special offer will change. When: Beginning October 1st, happy hour specials will be available Monday through Friday between 3:00 and 7:00 p.m. On Monday nights, $4 drinks will last from 7:00 p.m. until closing.